The REDARC range of Switch Mode Reducers provide a 12 volt nominal output from a 24 volt source making them ideal for running 12 volt lamps, small motors and electronic loads from a 24 volt vehicle input. REDARC Switch Mode Reducers are ideally suited to applications that require a low noise output and are designed to operate sensitive radio and communication equipment. A range of REDARC Compact Switch Mode Reducers, small in size, are designed to fit into tight locations for uses requiring a small output rating. The REDARC 3A Linear Voltage Reducer powers 12V loads including radios, computers and other communication equipment in continuous current rating of 3 Amps. The REDARC 7A Linear Voltage Reducer powers 12V loads including radios, computers and other communication equipment in continuous current rating of 7 Amps. The REDARC 10A Linear Voltage Reducer powers 12V loads including radios, computers and other communication equipment in continuous current rating of 10 Amps. 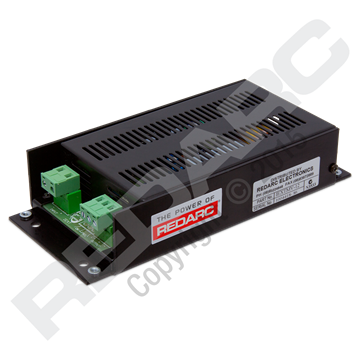 The REDARC 40A Switch Mode Reducer provides a 12V nominal output from a 24V source at 40 amps continuous rating. The REDARC 60A Switch Mode Reducer provides a 12V nominal output from a 24V source at 60 amps continuous rating. The REDARC 2A compact switch mode reducer provides a 12 volt nominal output from a 24 volt source making them ideal for running 12 volt lamps, small motors and electronic loads from a 24 volt vehicle input. The REDARC 5A compact switch mode reducer provides a 12 volt nominal output from a 24 volt source making them ideal for running 12 volt lamps, small motors and electronic loads from a 24 volt vehicle input.